This is such a BIG article that I’ve decided to break it down into chapters! And despite its ‘largeness’ (if ever there were such a word), I have contributed very little for a change. It seems that the attendees of the most recent TORQ fitness week in the Pyrenees have been struck with a dose of ‘writer’s perpetuity,’ which I for one am a massive fan of. Thanks folks, you’ve made my job very easy. Chapter 1: A few short comments about the 3rd TORQ Inspirational Fitness Week. 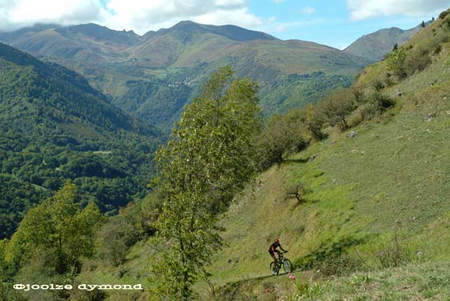 ”Hi Matt, A massive thank you for for a amazing time in the Pyrenees! Not sure if my legs are thanking you quite as much with the close on 22,000ft of climbing we completed in those 7 days!! (Thanks Viv for working that out). But the training value was just brilliant. A big thanks goes out to Ian & Kate Potter (AQR) also for supplying the awsome wilderness mountain trails and down hills, and of course Russ the Hotel owner & Chef, the food was “just great” the most talented down hill racer I’ve ever met for sure! Fantastic time with a fantastic bunch of people.” Regards Jeff Spetch. After a day’s fitness testing and a gentle warm-up ride (which took most of the day), the group trundled a few kilometres down the road to Aspet, the start and finish of the annual Transpyrenees event. We trundled down there in a minibus – we had to reserve our vital energy supplies for the event itself. We were swinging around Pyrenean hairpin bends, winding our way down to Aspet rubbing our hands with glee at the prospect of pitting our wits against the French. As we swung round one bend, we noticed Armstrong’s name written in paint across the road in true Tour de France style – then a few others like Zule etc. Around the next bend we swung and there in big white letters across the road were written the words “London W@*ker 2012.” Proof I feel that at least one French person was a bit sore at us for our Olympic bid success. How do I know it was a French person that wrote it? Well, surely a British person would have written “W@*ker” in plural – after all, that would have been grammatically correct. Unless of course the comment was directed at an individual like Tony Blair or Seb Coe? Anyway, it doesn’t matter, but it tickled me – I laughed about it all the way around the race course. What made it really amusing to me was considering what would have hapenned in ‘Old Blighty’ had the decision gone the other way and Paris had won. Absolutely nothing I reckon! I can’t imagine any British person giving enough of a monkeys about the verdict to get annoyed about it, let alone be bothered to traipse all the way down to B&Q, spend 20 quid on a bucket of paint, then lug it up to the top of a massive hill and splash it all over the road. Let alone splash it all over the road legibly? I take my hat off to the author for his or her passion. Don’t get me wrong. I’m over the moon that we got the olympics and I genuinely find this funny – and I’m a Londoner!! Thank god we’re all different eh? I thought the event was one of the best I have ever done. I thoroughly enjoyed it. The only downside was that I had to race as an alias (Ian Potter), because I needed to ‘borrow’ Mr Potter’s medical certificate to prove I was healthy – a necessity on entering. There was no proof on my person that Matt Hart was healthy, so I had to wing it. It was amazing. Everyone was remarking on how much weight I’d lost, that my bum was much smaller and how effortlessly I rode my bike down hill (You’ll have plenty of time to get me back for this one Ian, I promise). “After a year of training for the British National XC, Enduro and the couple of 24 hour events I have crammed into my first full race season, plus a season of guiding for A Quick Release Holidays, I thought it was time for a break…well my Coach insisted it was time for a month off the bike. So I took a step back from training seriously and decided to tackle the role of an organiser, quite a challenge for the most disorganised person I know. My task was to organise a group of British mountain bikers, who had booked themselves on a TORQ Inspirational week, to take part in the Transpyrenees. The September TORQ Inspirational week held in conjunction with A Quick Release Holidays, attracted riders from across Britain who were both competitive and non competitive mountain bikers. TORQ weeks held here in the French Pyrenees focus on learning more about fitness, nutrition, skill and bike set up, plus mountain biking each day on the most amazing single track. TORQ’s Matt Hart and myself thought adding a little race to the programme would be an extra activity for people to do on their day off…but not just a little race. 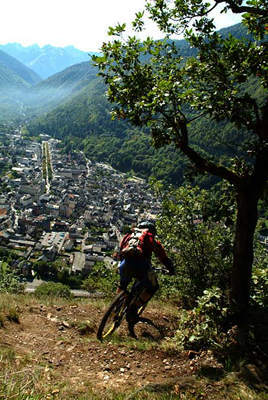 The Transpyrenees is an all day event, with the choice of 55-80km and over 2000m of climbing. My ever organised skills coach, race mechanic, pit crew and bike cleaner Ian Potter thought I was trying to exhaust our guests on only their third day here in the Pyrenees. Matt and I reassured Ian, after all it is a holiday and who wants to sleep in, eat cakes and be lazy on a holiday…well this lot certainly didn’t. I was quite excited about organising our guests to take part in this event, as I’m the one who is usually forced to relax and do nothing before a race, while my husband Ian organises everything for me. How hard could it be to transfer bikes and bodies to the start of a race in the middle of the French Pyrenees, ride my bike for 80km and then return back to the hotel. Well I couldn’t sleep the night before as I worried about every minor detail…I was eating breakfast at 5am, the bus ended up being an hour late and the driver wasn’t sure where the start of the race was. However all the competitors and our photographers Joolze & Dave appeared quite relaxed, in fact they were more interested in the tarmac and what the French had written all over the road about the Angleterre ‘wa”!ù$ers’ for winning the 2012 Olympics’. I would like to say this fired our British contingent up to go and show the French a thing or two on their home turf, but instead I heard pleas from the party to stop for photographs as they thought it was hilarious [Ed. Unfortunately we didn’t get any photos – it’s true honest!]. As we continued on, narrowly missing a cow, my limited French vocabulary with an aussie twang was trying to explain the directions to the bus driver. Somehow I found the words ‘au gauche’ et ‘tout droite’ as the bus driver explained in fluent English that it was unlikely the race would start on one of the highest cols in the area when the race profile started at 400m. Well, believe it or now we found the town of Aspet and the start of the race. However I knew I wouldn’t be relaxed until every member of the race party were lined up on the starting grid and ready to race. As we registered I was handed a bottle of red wine, which I thought was to calm my ever present nerves and the stress that must have been showing. As I raced to the bikes to ensure everyone knew what they were doing I realised that every competitor was being handed a bottle of merlot, so much for gels and energy bars, we were racing in France. I could finally relax, with a sigh of relief, as the group were in fine spirits, lined up and ready to take on the French…all except me! Half the group decided to race the 80km loop, while the others entered the 55km loop…trios, deux, un! The first group were off with a 15-minute break before the next group. As the dark clouds gathered in the distance each of us had begun our little Pyrenean adventure, with a story or two to tell by the end of it. It was such a relief to make it back to the hotel, with everyone in fine spirits, after a top performance from the Brits and one very relieved Aussie. Jay Spetch received a super sized trophy for a sensational second place in the 55km event. Viv Hazelton and myself were awarded super sized T-shirts for being the top placed women in the 80km. Matt Hart also achieved a fine 12th place in the 80km event, after discovering more Pyrenean trails that weren’t actually part of the course. I guess you could say Matt won the 90km event, if there was such a category. The Transpyrenees attracted riders from all over France, Spain, New Zealand (almost forgot you Viv), plus a small but very strong British force and one mad Aussie. A great event to be part of as we poured our wine into Jay’s cup and made a toast to a fine race all round. Now I promise to chill and perhaps stick to 24 hour racing…organising is far more tiring! Chapter 3: Phew! A couple of comments about the race and the week in general. “The course provided a variety of terrains and technicalities with virtually none of the bottle necks often found on such events. The road sections were short and as one would expect in this part of the world the climbs were testing and sometimes technical but all rideable. The way marking was generally good but over the course I came across very few people that hadn’t taken a wrong turn at some stage, even the locals were asking me for directions as we approached various junctions, luck rather than judgement meant I more often got it right. Many locals turned out to spectate and gave tremendous support and shouts of ‘allez allez’ to the riders. The food stations were plentiful and well stocked, one of our team taking time to enjoy some pâte and bread at one stop – very French and civilised. As the course was relatively tough to the typical UK enduro it took a little longer than I am used to for the distance so I was almost relieved to see the finish and be welcomed home by team super hero Jay Spetch who had finished in a stunning second place. Chapter 4: The rest of the week, by James Lusher. ”It’s 4.30 on a particularly wet August afternoon and the phone rings: “Hi, Simon here. I’m going biking in the Pyrenees for four days in September. Are you coming?”. Work has been getting in the way of any off road antics for a few weeks despite the local trails being dry and inviting so I don’t hesitate. “I’ll call you back in a mo”. I check the domestic diary with my wife and get the all clear. In 12 hours the flights are booked and a deposit is in the post. In the next few weeks I’ve taken a brief look at the TORQ website, stepped up a bit of training in the gym and taken the bike in for a service. There the preparation ends. Again, work dominates so without much more discussion, I’m on the flight to Toulouse feeling excited but also apprehensive that we’re joining mid week and other members of the holiday week have had three days to warm up their legs. I’m going to have to hit the ground running. Once the transfer drops us off at our modest hotel in Luchon, we hit the town for moule and fritte, neck a beer and get back to the hotel to assemble our bikes. We’ve been travelling since 5.30 in the morning and we’re both itching to hit the trails. Fortunately Ian, our guide, is waiting to help with assembly and take us into the hills. The bikes get assembled but with each turn of the allen key, a mild drizzle outside is decaying into a typical mountain storm. Raindrops the size of golf balls (and plenty of them) are accompanied by thunder and lightning. We’re not going anywhere! My bike assembled I’m tired and disappointed. But Ian suggests we spend a few minutes looking at bike setup and we oblige. Talking bikes in an oily shed isn’t what I came here for, but as I’m to learn in the next four days, those few hours spent fettling are going to give me the ride of my life. 7pm and another beer is downed. Our fellow bikes return from a trans Pyranean enduro and I’m starting to wonder what’s going on. There isn’t a trail bike in their stock and hardly a riser bar. Just Epic’s and skinny tyred hardtails. As for the riders themselves, lean and mean is the order of the day. I’m starting to wonder what sort of a trip I’ve come on and why I’m the only one taking beer from the hotel fridge. The next days dawns and we enjoy a leisurely start. Matt of TORQ, our Fitness Instructor and host for this week talks us through nutritional technicalities. At 10am we crowd round a turbo trainer to practice smooth pedalling. Hmm. I’m from the “Just get on your bike and ride” brigade. I show willing but I’m yet to be convinced. At last we’re off for the day, equipped with a large supply of Torq bars and baguette energy for later. Our first hour is spent practicing technical climbing and – I’m really crap. I tried my hardest but spun out on the section that everyone else climbed. Surprisingly, there was no distain, from instructor or fellow bikers just a few insightful observations from Ian, and a trip back down to practice again. This time, I’ve a better idea of what I’m doing and while I don’t clean the section, It’s a marked improvement on the first attempt. A short traverse leads us to another climb. “Never been cleaned” says Ian. I’m not surprised. It’s a 20 metre climb that is exceptionally steep but twists itself around a whole tangle of roots. Matt pushes top the front and is immediately on the climb. The rest of us fall silent as we watch him climb. A steep section leads to a rooty step. Matt pauses on the climb, balances and hops his back wheel up, pushes his cranks to move up to the next section, another twist in the trail, he balances, almost dabs but then pushes on to crest the top section. We all applaud but despite efforts none of us match him. Maybe I do have something to learn here! The rest of the day is spent climbing into the mountains and getting to know fellow bikers. We’re alone on these trails and the scenery is marvellous. Day 2 (for us) is a big one. More technical talk from Matt is followed by a days climbing up one of the highest hills in the area. I’m putting into practice everything I learned from the day before and I need it. After lunch we climb for over an hour and a half non stop up a steady but very steep fire road. I concentrate on my pedalling technique and the climb is easier, despite the sweat dripping from my face. Ian and I get to know each other much better as he patiently helps me along at the back. What surprises me is not that the others are faster, but that as we complete each section, my new found skills are helping me stay steady and consistent all the way. We catch Simon resting in the shade three quarters of the way up and my motivation soars – maybe I’m not the only one struggling. We complete the climb together to a high point which has some fantastic mountain views. A rest and drink and a torq bar and Kate (our other guide and Specialised team rider) talks us through the descent. What follows is three hours of awesome and ever changing fast, technical descending. A ribbon of singletrack flowing through the heather is followed by a woodland traverse with roots and logs to catch the unawares. More fast flowing moreland peppered with rock gardens to check your speed. Always the views ahead are airy and exhilarating, but no section is life threatening. Into another wood and the switchbacks start, twisting left then right to ensure you get your rhythm. I’m feeling less of a mug in the descents and catching my new chums fast helped by one of the few suspended trail bikes in the pack. My arms ache. The acid is burning in my legs, but my smile stretches from ear to ear and wont go away. A brief rest while we stop for some photos is followed by another hour of fantastic technical descending and then we pop out of the woods 10 metres above the hotel and dash back for a shower and some food. What a day! My initial apprehension is replaced by sheer exhilaration. Day 3 is the big one. We’re going to the top of Superbagneres a 1200 metre climb and descent. A few of us start the morning with a coaching session on descending switchbacks from Ian. He shows me why I tend to run wide on the bends. I follow his advice and – like magic – I start to rule my bike rather than it controlling me. Climb follows climb and it’s hard. I’m pleased that I sat in on Matt’s lecture on fuelling the body. My normal approach of orange squash and a Twix just wouldn’t be enough to cope with these Pyrenean exertions. 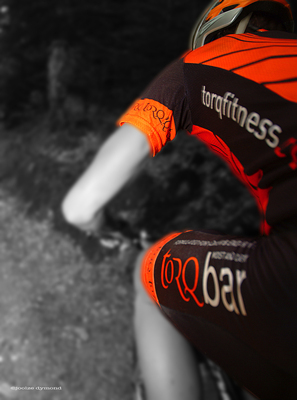 Here, getting the calories and energy in the body through our TORQ bars is making all the difference. Despite one of the hardest days on my bike yesterday I’m feeling strong. I thought that yesterday was the best day of my biking life but it’s bettered by today. We top out at the ski lift high point, in the thin air of 1800m metres. It’s been a really hard climb, with the final section completed under the astonished gaze of the local French sightseers. There are congratulations all round within the team. Ian briefs us on the decent and then leads us down some of the fastest, most technical trails I’ve done. I’ve stopped mincing; too tired and more confident than ever. As we hit a series of tight continuous switchbacks I’m putting in to practice this mornings coaching tips. Tight turn follows tight turn and I miss only one, too close to Simon in front to execute it cleanly. I’ve improved so much in such a short time, and on a bike that with its shock settings carefully adjusted under Ian’s guidance, rides and handles like a dream. That evening the hard work is done. All too quickly the hard riding is over and after a leisurely ride tomorrow morning we decamp for Gatwick courtesy of Easyjet. The last evening meal is a buzz of trail tales accompanied by the wonderful cooking of our host Russell, chef and freerider extraordinaire. There have been some salutary lessons over the last few days. At last I’ve biked up and down some real mountains. I’ve seen the next level in terms of technical ability and fitness and understand now that it cant be obtained by just “riding my bike”. Best of all, I’ve come away from the experience a better rider, better equipped to take on challenges for the future. Well that’s it. THE END. 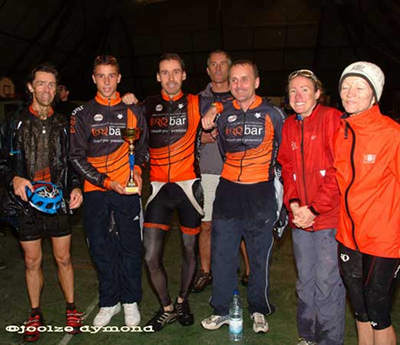 End of January 2006: TORQ Volume Training Camp. 7 days. This will be in the sun (venue TBC) and is aimed at the enthusiastic cyclist. We will cater for all abilities, but the objective of the week is for the rider to get as many hours in on the bike as possible, so you’ve got to be serious about your training for this one. Mountain Bikers and Roadies welcome. TORQ’s daily inspirational seminars and workshops as usual too. Optional fitness testing available at heavily discounted rate. 16th to 23rd March 2006: TORQ Inspirational Fitness Week in Spain (Pre-season Tuning). 4 day or 7 day options. All abilities welcome, you’ll just need to have a keen interest in becoming a better Mountain Biker. 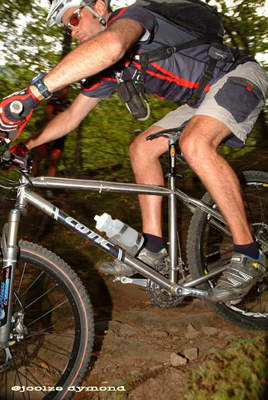 This incorporates a round of the Kona global 24-hour series. TORQ’s daily inspirational seminars, workshops and technical coaching as usual too. 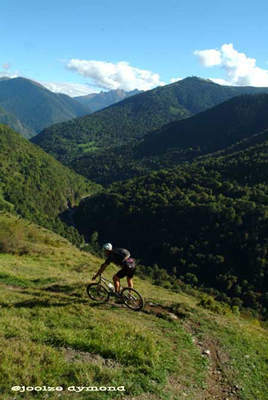 Late May/early June 2006: TORQ Inspirational Fitness Week in Pyrenees (Peak for Mountain Mayhem). 7 days. All abilities welcome, you’ll just need to have a keen interest in becoming a better Mountain Biker. This week is aimed at peaking you physically and mentally for the biggest 24-hour event in the world (3 weeks after you return). TORQ’s daily inspirational seminars, workshops and technical coaching as usual too. Optional fitness testing available at heavily discounted rate. 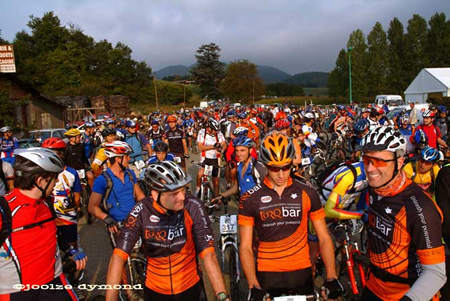 Late September 2006: TORQ Inspirational Fitness Week in Pyrenees (The Transpyrenees). 4 or 7-day options. All abilities welcome, you’ll just need to have a keen interest in becoming a better Mountain Biker. This incorporates the Transpyrenees event that you’ve just read about. 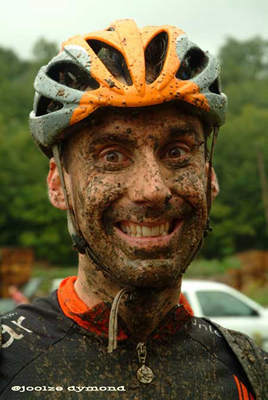 TORQ’s daily inspirational seminars, workshops and technical coaching as usual too. Optional fitness testing available at heavily discounted rate. If you are interested in any of these weeks, please don’t hesitate in contacting us at enquiries@torqfitness.co.uk or phone 0845 128 4312 to reserve your holiday. Places are strictly limited and as practically everyone who came on one of our weeks this year has expressed a strong interest in returning for 2006, we are anticipating filling up quite quickly.